Last summer my daughters approached me about coloring their hair. I was pushed into an uncomfortable parenting corner, being an enthusiast of sorts when it comes to coloring one’s hair (I’m not sure they even know what my natural hair color looks like), yet thinking that they are so young and that I would not consider paying for it to be done. Then they filled me in on a new technique that was whizzing through the elementary school aged crowd – Kool Aid hair dye. After a half hour watching You Tube videos on application instructions I relented. 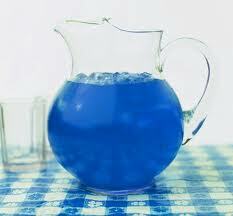 They bought their own Kool Aid for it and we were in business. And it works, it really does. It works so well that nine months later, I still see the streaks of magenta in Cameron’s hair. But if stays so long after being applied to human hair, then what in the world does it do to the insides of our bodies after being ingested by children all over the country? Last week I saw an article in The New York Times, “Colorless Foood? We Blanch”. It discusses the a link between the use of artificial dyes used in food and hyperactivity in some children. An advocacy group proposed banning their use. But a food chemist noted that food color actually has a lot to do with the pleasure of eating, especially with flavor expectation. She states that, “Color can actually override the other parts of the eating experience”. It turns out that vanilla pudding dyed yellow is reported to taste of banana or lemon. Have you ever had a blind tasting of both red and white wine that is at the same temperature? It’s crazy that it can be hard to tell the difference between them without seeing the color. We end up actually tasting what we see – even when it’s not there. Color is important to how we feel about what we are eating. You may be thinking that you don’t consume Kool-Aid, Doritos, or box macaroni and cheese. Food dye may not be something you would miss. But how about those beautifully colored French macaroons in a fancy bakery? How about the green warning of the wasabi you dab on your sushi? What about M&Ms for heaven’s sake? As much as I am concerned about the color of the lining of our children’s stomachs from Kool-Aid, it is today’s food culture of ultra self-consciousness and profound seriousness that bothers me. Now in the interest of hyperactivity (hello sugar?) we might lose the purple smiling mouths of children who have just had a grape popsicle. The concern for how our food is grown, produced, and packaged is important. Of couse it is all so good, so morally right, and so admirable. The problem is that it is no fun.